Was around the area when this Laksa stall caught my eyes. 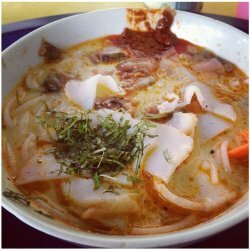 $2 Laksa! Where can you still get a bowl of Laksa for only $2? I knew I had to try! The Stall looked very traditional as well, with a huge silver pot cooking over a charcoal stove outside of the stall. Looks like a sure sign for good food. I actually upgraded my Laksa to $3 as I'm a big eater. The Laksa is very interesting as when my food was ready (it was self-service), I looked around for chopsticks and there wasn't any. And then the Auntie told me.. 'spoons only'. Well, the noodles are cut before serving so you will not have any problems with eating with only a spoon. This is truly one of the best Laksa I've ever had! The soup base is strong with the taste of shrimp & even though it looks like a lot of chili had been added, it's not spicy at all. The noodles are tangy and soaked up the soup well.. My mouth is watering just writing these out!